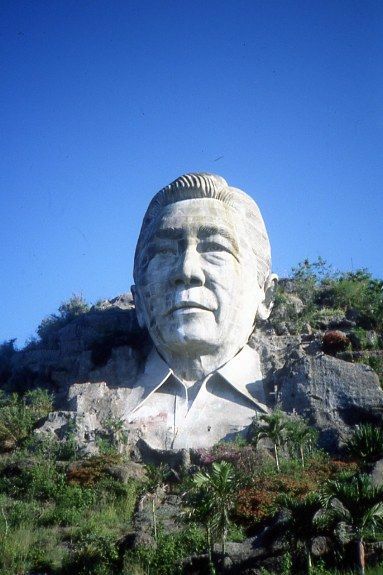 At the height of his power in the 1970’s former president/dictator of the Philippines Ferdinand E. Marcos commissioned the construction of a 99-foot concrete bust in own image, situated on a cliff overlooking the South China Sea around 130 km North of Manila. 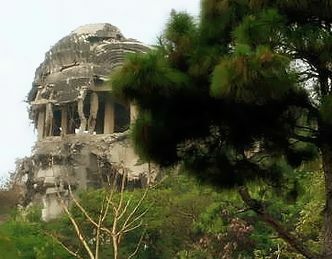 In 2002 it was torn apart in an explosion, the eyes, forehead and cheeks blown to bits- suspects included left-wing activists, members of a local tribe – or possibly looters hunting for one of Marcos’ legendary treasure troves. 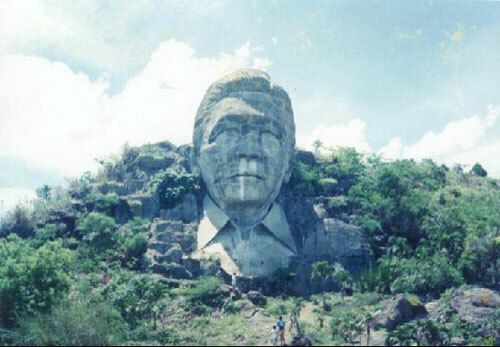 The bust was completed in the early 1980s when Mr Marcos was still in power, but fell into disrepair after he was overthrown in a popular revolt in 1986. He died in exile three years later. This is a real modern-era Ozymandias, the broken remnants of a statue to a powerful man who grabbed command by the throat and rode it until he was overthrown. In death, his statue becomes the victim. Intact, before treasure-hunters blew it open looking for hidden war bonds and gold. Like something out of a communist dream. Back and side view with his eyes blasted out. Clear contrast of how his dream fell apart. In the years since the explosion, it has degraded even further. Just a skeleton with no features, now. Surreal. Ozymandias, indeed. 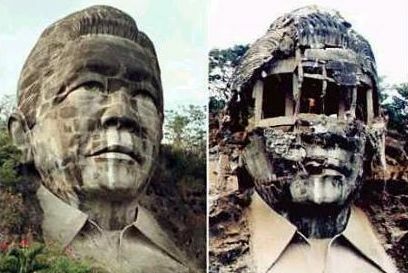 At least in this case, the Philippines is doing a bit better post-Marcos than Ozymandias’s kingdom did. On site design: Have you changed fonts in the last day or so, or am I just getting different results on my home PC (Opera 10.0) versus my work PC (IE 6.x)? In any case, it looks good. However, the story summaries for “Haikyo” and “Ruins” articles in the side bar doesn’t do much for me. Having recent articles listed by category in the sidebar is fine, but including the lead paragraphs there (which just duplicates what already appears in the main section) pushes the recent comments list down too far. Hey David, thanks for feedback on site design, and you’ll be glad to hear the excerpts in sidebar are just a holding pattern, got interrupted in the middle of figuring out how to change them to image excerpts, think that would be better, make the site more interesting. Font, don’t think I made any changes, maybe just the browser. OK. The thumbnails in the sidebar is a good idea. Cheers David, just about finished tinkering now. dang im bummed that they blew it up before if ever had a chance to see it. This is a familiar landmark for me. First saw it when I was six or so, with no idea what it represented. For my entire college life, I’d pass it when I travel back & forth my hometown to Baguio City. The first time I saw it broken was a shock. I’m not sure if there’s still anything of it left. Solo- Right, and as Kat says above, probably nothing left now. Kat- Great info, thanks a lot for commenting. After the shock that it was broken, did you feel glad? I don`t really know the politics of the situation, but the dictator was a bad guy, right? 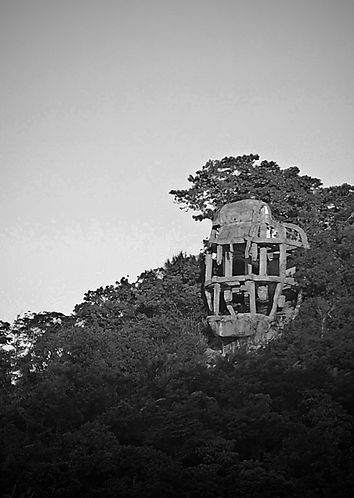 An Isinay (northern indigenous tribe) sculptor built it. 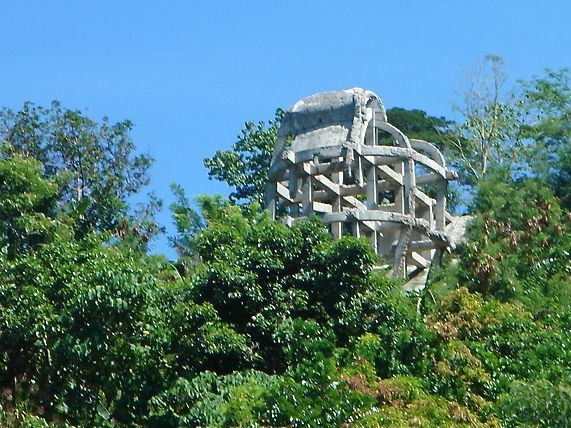 It was commissioned to him by the late secretary of tourism, Jose Aspiras . He was the lone sculptor graduated in 1957 at U.P.diliman. The inspiration, a devil or an angel,, is not relevant, but the art work itself. he died during its finishing touch. The sculptor’s name, ANSELMO B. DAY-AG, and he is my father.